Wellington, 2 October 2014 – One of the tallest buildings in Wellington, Plimmer Tower, and its associated car parking building have come up for sale at a time when Wellington’s office vacancy is decreasing and quality investment opportunities are rare. The freehold 34-storey towers and car park are marketed by Ryan Johnson of CBRE New Zealand and Bill Leckie of Colliers International on behalf of joint owners Toga NZ No.1 Limited and Core 3B Plimmer Complex Limited. The properties are for sale individually or separately by deadline private treaty, closing 4pm on Thursday 6 November 2014. Plimmer Towers offers 34 levels of mixed use space, with 21 office floors and five levels of retail and commercial accommodation at the lower levels. Originally developed by construction tycoon Arthur Williams, and later named after Wellington business and political figure John Plimmer, a single tower designed by Warren & Mahoney was opened in 1977 as the Williams Centre. The Tower underwent a major refurbishment and upgrade in 2010, which included the redevelopment of the podium levels 1 to 4, common areas and multiple office floors. The refurbishment also included new escalators linking the retail areas in the building to Lambton Quay, a new café and lift entrance lobby on level 4, plus a full repaint, giving the complex stronger street presence in the busy retail, entertainment and business precinct. Being sold separately or together, the associated car park building offers 662 bays across 9 levels, 640 (approx) of which are leased by Tournament Car parking. With strategic connections to State Highway One, it is a popular parking option for Wellington commuters. With a NLA of 14,595sqm and a typical floor area of 575sqm, the tower enjoys low vacancy and high quality, long term tenants, says Bill Leckie. Bill Leckie says the property offers diversified income, with net passing income of $2,794,074 for the tower and $1,375,750 for the car park, for combined net passing income of $4,169,824 if both buildings were purchased as one. Occupying a prominent corner site on Boulcott Street and Gilmer Terrace, the Towers enjoy a central Wellington location in close proximity to Lambton Quay, accessed via Plimmer Steps. The complex offers several key connections, with the Wellington Airport a 15 minute drive away, the Railway Station a 12 minute walk away, and the stunning Wellington waterfront can be reached in just seven minutes by foot. 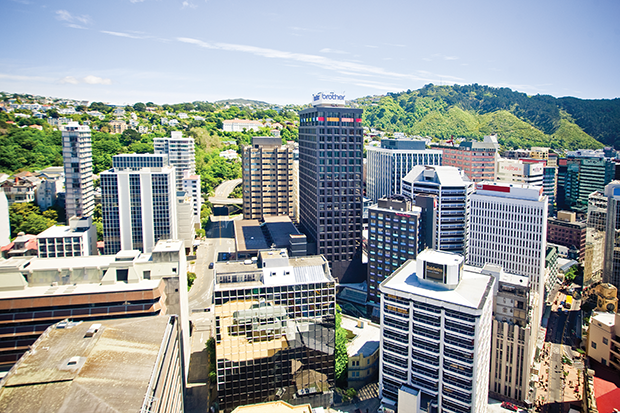 Bill Leckie also says that opportunities to purchase seismically-sound iconic building with a good income stream from tenants are a rare occurrence, particularly in Wellington’s tightly-held office market. Johnson says that according to CBRE’s latest New Zealand Investment MarketView report, the New Zealand investment market is going from strength to strength, and looks set for its strongest year of commercial property investment sales since 2007. The largest Wellington transactions during 2014 were the Harbour City Centre for $45.85m, Grant Thornton House at 215 Lambton Quay, which sold for $63m and NZ Post Petone, at 47 The Esplanade which sold for $15.4m. Another substantial sale involved Freyberg Building at 20 Aitken Street which sold for $13.8m. A video showcase of Plimmer Towers can be found at on CBRE’s YouTube channel.